For those of you who are currently using Boxee, which is currently in beta have a reason to rejoice as Boxee announced two new exciting features of its service. 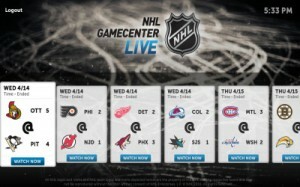 First is that NHL GameCenter LIVE is now available on Boxee. Â If you are subscribed to this service on a monthly or annual basis, you can now enjoy watching great Hockey games and fights in HD mode on Boxee. File Identification Progress – This feature lets you to easily see how many files Boxee is scanning, has identified, and doesn’t recognize in your media collection. Â You can check the status of its media from any menu sidebar or from the Media settings menu. Manual Movie and TV Show Identification – This feature lets you tell Boxee what’s in your media collection. It allows you to change incorrectly labeled files, find and identify unresolved files and select files to label them correctly. Facebook & Twitter in your Boxee feed – Boxee Beta now lets you see recommendations from your Facebook and Twitter friends and contacts within Boxee. You can see shared videos in your feed with an icon on the right that tells you where they are from. New & Improved RSS Management – The new version of Boxee Beta also now lets you better manage, discover and play RSS feeds in Boxee. You can search, arrange by category or sort through the most popular, top rated, new and HD feeds available on your Boxee account. You can then use the RSS feeds app to play back your favorites. Bug Fixes and Fixes and Fixes, and Fixes! – Of course, just like any other version updates, the new Boxee Beta has addressed hundreds of bugs and issued various fixes to these. From the same people behind tech news aggregator Techmeme comes a similar service called Mediagazer, aggregating your daily dose of media news. 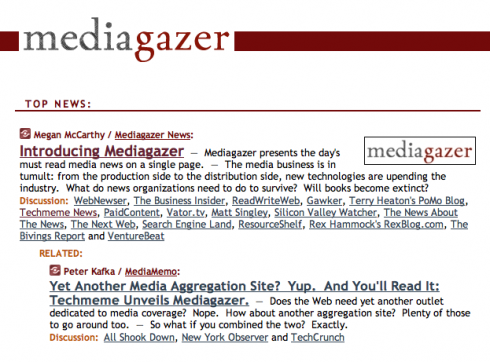 Mediagazer is backed by media companies such as WordPress, Seesmic, Zemanta and others. So, if in your daily browsing of the Internet you encounter questions such as “What do news organizations need to do to survive?”, Â “Will books become extinct?”, “Can video bring television and the internet together?” and other questions regarding new or old media Mediagazer will organize them in a similar fashion as Techmeme. In other words, everything else that don’t fall under Techmeme, you can find it on Mediagazer. Mediagazer is organized through the same technology and process as Techmeme, that is combining automated aggregation technologies with direct editorial input from human editors. The media news memetracker collects relevant takes on an issue and package these into group of links. And just like Techmeme, Mediagazer also makes it easier to share headlines via a recently introduced “share” button. A mobile site is also up and running if Â need to get your daily fix of media news Â via smartphones on mediagazer.com/m or through mediagazer.com/mini for simpler phones. So there, another site to monitor for daily news coverage. Hopefully, the human editors of Techmeme and Mediagazer will be able to distinguish clearly what should be aggregated on each of these news verticals and duplication of entries will not happen. Â Otherwise, they Â might as well combined these two aggregators later on.